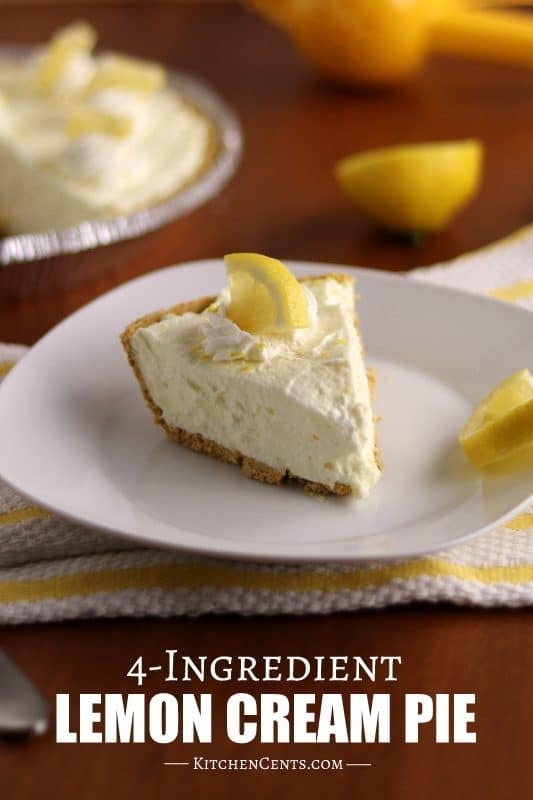 4-Ingredient Lemon Cream Pie – a semi-homemade no-bake cream pie made with an easy lemon cream filling, graham cracker crust, and can be ready in 5-minutes. An easy delicious lemon dessert. I’m a lemon lover through and through. This recipe came to me one late night when I was having a hankering for something lemony sweetness. I had a lemon, cream, lemon filling, and a graham cracker pie shell in the pantry. I went for it and am so glad I did. 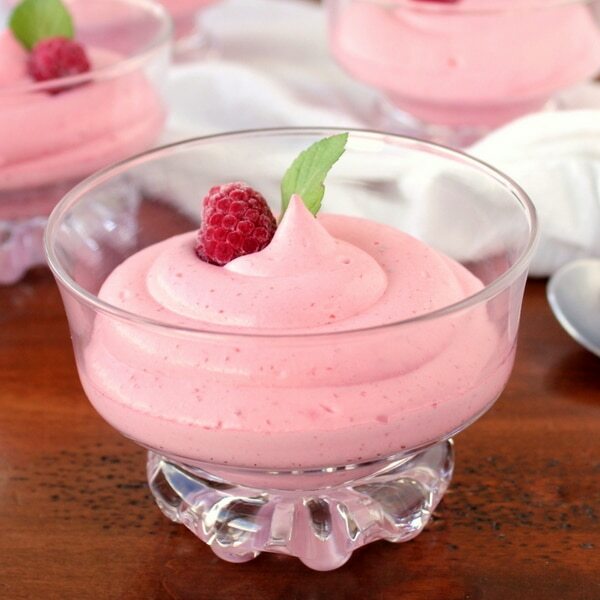 I’m obsessed with all things light, airy, and creamy like this Easy 3-Ingredient Chocolate Mousse or this Easy Raspberry Mousse. Why not try with lemon?! That was my thought. 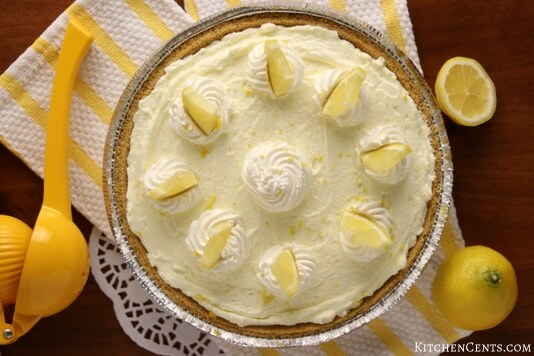 This easy lemon cream pie is packed with zesty lemon tang and sweet, smooth cream flavors. 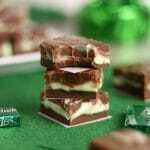 It’s so easy to make with only 4 ingredients. You can have it for yourself in about 5 minutes. 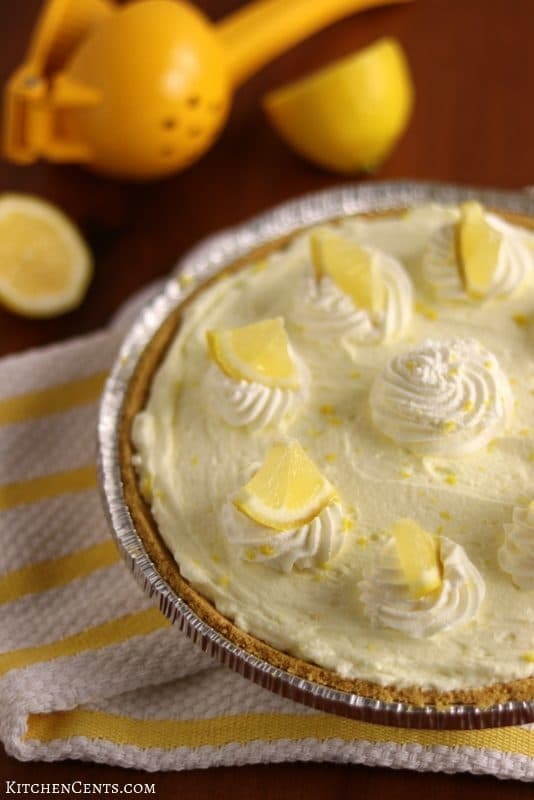 This lemon cream pie is a perfect spring or summer dessert to share at a family gathering, Easter, Mother’s Day and so much more. 4-ingredients! It’s as simple as that. I love this recipe because it’s light, creamy and full of bright lemon flavor. It’s so easy to make and it can be a pantry special. DO I HAVE TO USE HEAVY WHIPPING CREAM FOR THIS LEMON CREAM PIE? Yes. 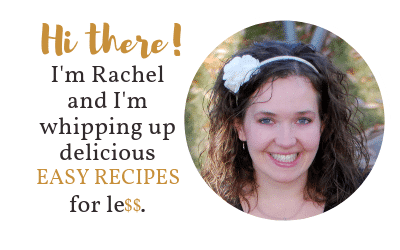 I highly recommend using HEAVY whipping cream in this recipe. Heavy whipping cream has a higher fat content which allows for a stiffer, more stable whip. It helps this pie maintain its shape after being cut rather than oozing everywhere. PRO TIP: When making whipped cream, whip the cream in a cold (chilled) bowl. To chill the bowl, pop it in the fridge or freezer 20-30 minutes before you plan to whip the cream. This helps the cream stay cold during the whipping process which helps the cream whip easier, quicker and to its full potential. With most things, homemade ingredients and recipes taste better than store-bought but both come with a price. There are pros and cons to each. Store-bought and premade items can be costly, have less nutritional value and more preservatives. Homemade recipes can be time-consuming and frankly hard to get right sometimes. 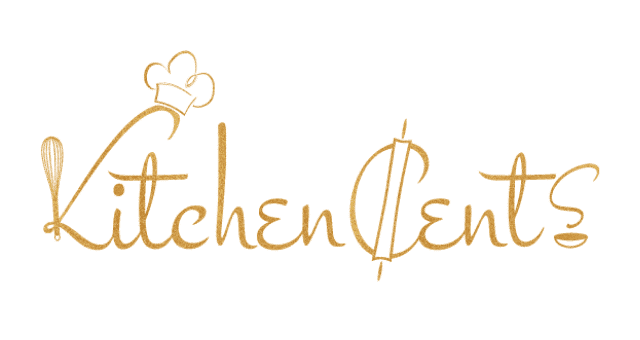 I typically make things from scratch because they are cheaper, taste better and I can control what’s in them. With that said, this lemon cream pie is super delicious either way. If you have time and resources to make your own graham cracker crust and lemon curd, I would highly recommend it. 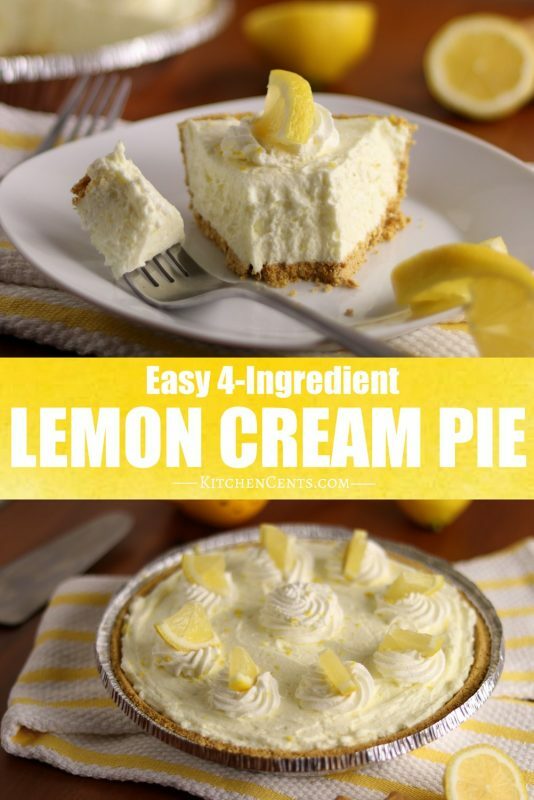 If you don’t have the time to make everything from scratch, this 4-ingredient lemon cream pie recipe (full printable version below) is great too. It’s super fast to whip up and fairly inexpensive. I typically have a can of lemon filling and graham cracker crust pie shell in the pantry for when I’m in a pinch and need a fast dessert. LOOKING FOR A GREAT SUMMER TREAT? 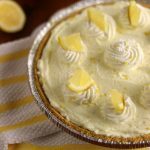 If you are looking for a delicious, refreshing, frozen treat to cold off with this summer, try this lemon cream pie FROZEN! It’s like a lemon cream ice cream pie and it’s fantastic! Graham cracker crust pie shell – $1.39 (this pie would also be awesome made with an Oreo crust. Lemon and chocolate are so good together)! This easy lemon cream pie makes 8 servings. At $5.35 a pie that breaks down to 67¢ per slice or serving. At that price, this is an inexpensive lemon treat everyone will love. WHAT’S YOUR FAVORITE LEMON DESSERT? 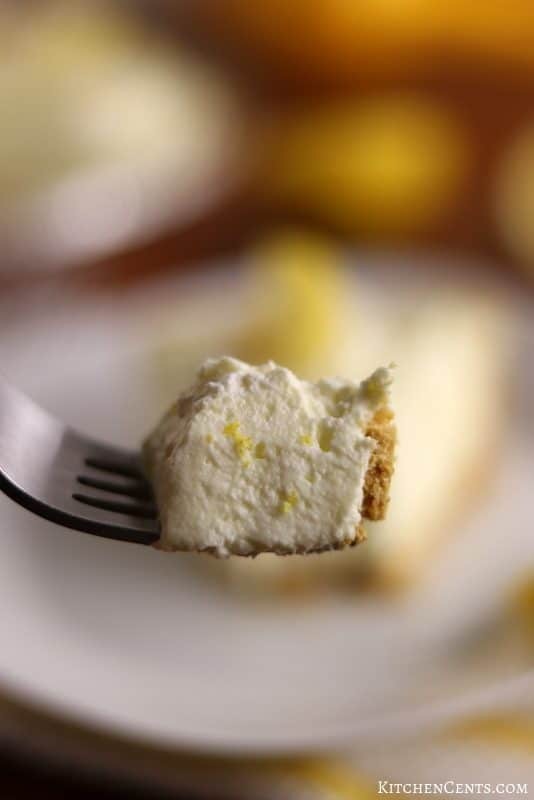 A semi-homemade lemon cream pie made with an easy lemon cream filling and graham cracker crust. A delicious 5-minute lemon dessert. In a bowl, add lemon creme filling, lemon zest, and lemon juice. Blend until fully incorporated. In a large bowl, whip heavy whipping cream to stiff peaks. Do not over whip or it will turn into butter. (If desired, reserve 1/2 cup whipped cream for garnish, add 1/2 Tbs powdered sugar to sweeten). Pour lemon cream into 9" graham cracker crust. Smooth. If desired, pipe reserved whipped cream on top and add small wedges of lemon. 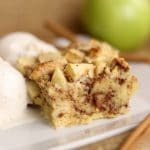 Enjoy immediately, freeze for later or store in the fridge until ready to serve. Looking for a frozen lemon treat? 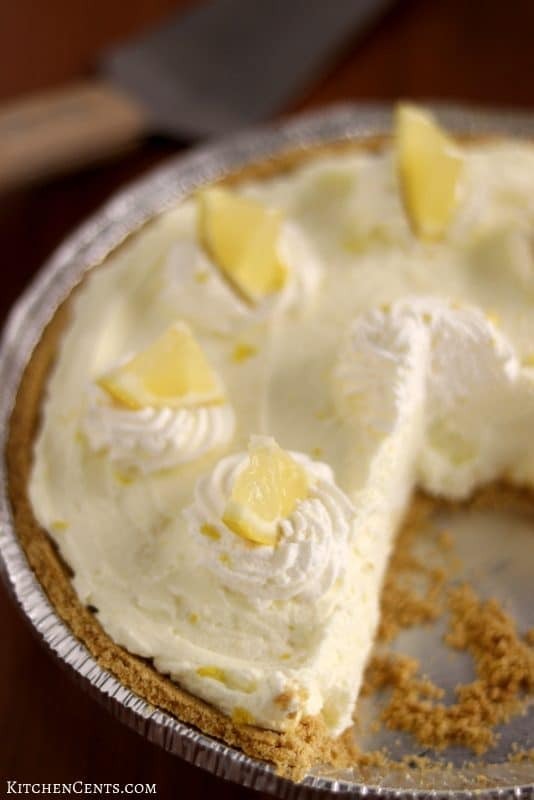 Try this lemon cream pie frozen! PRO TIP #1: Use HEAVY whipping cream in this recipe. Heavy whipping cream contains a higher fat content than regular whipping cream which will allow for a stiffer more stable whip. PRO TIP #2: Chill bowl before whipping the cream. This will help cream stay cold and whip quicker and stiffer. Oh wow! 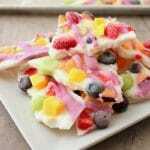 This is a perfect idea for Easter and it is so simple with only four ingredients. I am looking forward to trying it out!